In your dashboard, head to MemberPress -> Activate -> Addons. There you will find a link to install the MailChimp 3.0 Addon. You can find your API Key in your MailChimp Account settings. Account -> Extras -> API keys -> Your API keys. You may need to create an API key if none are listed. The MailChimp 3.0 Integration uses only one list. Select the list you would like to be associated with your website members. MemberPress will add this Tag to all new members who signup on your site and set its value to either "0" or "1". A value of "0" is set if they did not check your opt-in checkbox when signing up. If you'd like to setup a special Tag for each Membership level, (strongly recommended) follow Step 5 below. The power of this integration comes from your ability to add a specific Merge Tag for each Membership level. 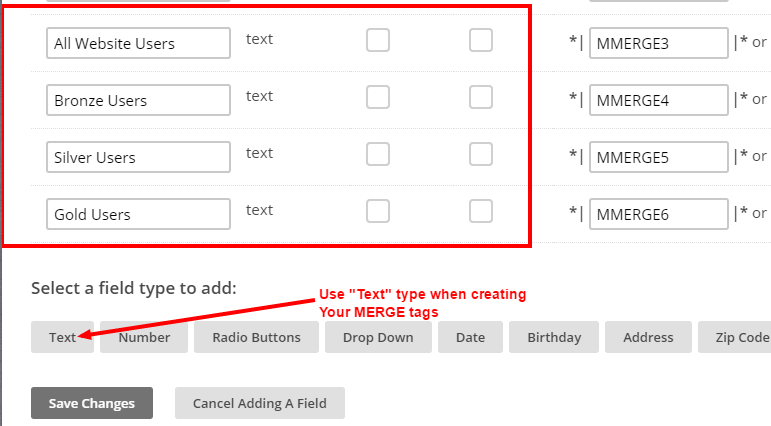 We recommend that you create a "text" type Tag for each of your Memberships. MemberPress will set the value of these Tags to "active" when the member is active on that Membership, and "inactive" when the member is no longer active. This is a powerful way to create specific segments for your List and target only the customer's you want for your various marketing/news Campaigns. Create new "Text" type fields which are not required and are not visible. We recommend creating a global Tag (Ex: All Website Users), and other Tags for each Membership Level (Ex: Bronze, Silver and Gold). 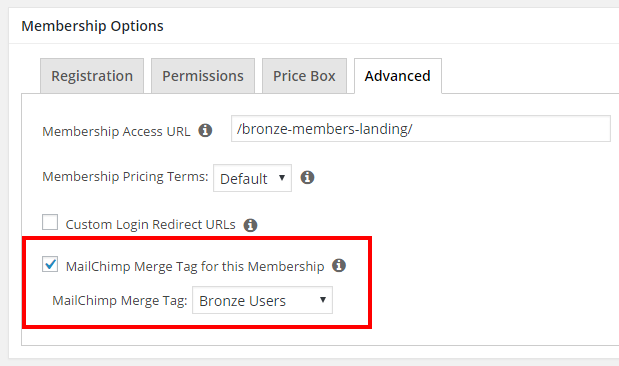 MemberPress will update the value of your Membership-specific Merge Tags to active or inactive depending on the status of the member's subscription to that Membership level. You can use this information to create targeted, dynamic (auto updating) segments for your List. MemberPress also sets a value of "1" to the global Merge Tag you have defined in the MemberPress -> Options -> Marketing tab. This value may be set to a "0" if you have the opt-in checkbox enabled, and the user did NOT check that box when signing up. Think of the global Tag as a catch-all for every member on your site.